A rare and particularly striking albino orangutan who was rescued from villagers in Borneo last year has been released back into the wild following successful rehabilitation. The 5-year-old female seems fit and ready to tackle the demands of forest life, but poaching remains a primary concern. Alba, as she’s been named, was rescued in early 2017 by the Central Kalimantan Natural Resources Conservation Agency (BKSDA) and the Borneo Orangutan Survival Foundation (BOSF). She had been captured by curious inhabitants of Tanggirang, a remote village in the Indonesian part of Borneo. Stressed, dehydrated, and suffering from parasitic worms, Alba was brought to the Nyaru Menteng Orangutan Rehabilitation Centre for rehabilitation. At the time, it was thought Alba could be released to the wild after a few months, but her journey to full health has taken a bit longer than expected. 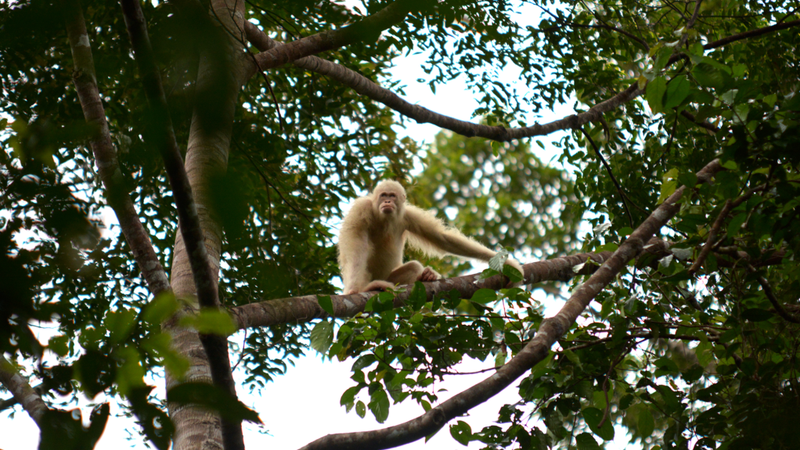 As an albino, she’s susceptible to several health conditions, including poor vision and hearing, sensitivity to light, and a predisposition to skin cancer. Alba is the only known albino orangutan in the history of the species. As BOSF now reports, Alba, along with Kika, another rehabilitated orangutan (not an albino), were released to Borneo’s Bukit Baka Bukit Raya National Park (BBBR) on Wednesday December 19, 2018. BOSF had originally planned to cordon off a 12-acre (5-hectare) patch of forest and release Alba under its watchful eye, but it was ultimately decided that the orangutan should roam free in her natural habitat. 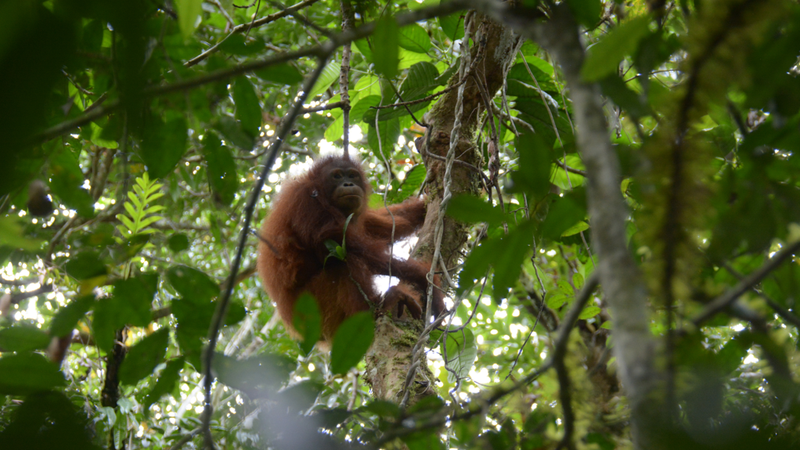 “Thanks to the intensive care provided by our dedicated veterinary team and orangutan caregivers our Nyaru Menteng Orangutan Rehabilitation Centre, Alba slowly recovered and showed us her excellent climbing and socialisation skills,” noted the BOSF in a statement. After an arduous 16-hour journey over land and river in which Alba and Kika were caged and anaesthetised, the BOSF team arrived at BBBR national park. Kika sprung from her cage when the door was opened, but Alba’s departure was a bit more subdued. Alba, BOSF said, expressed a “firm dislike for human presence from the very beginning.” Her behaviour after release suggests her opinion of humanity hasn’t changed as a result of her prolonged rehab stint, during which time conservationists did their best to avoid the animal becoming habituated to or dependant upon humans. Alba is now actively moving in forest canopy, typically at a height of 115 feet (35 metres) or more. Her quick adaptation to forest life isn’t entirely surprising as she “has no inferiority complex” and she’s “very confident compared to other orangutans,” veterinarian Agus Fathoni told the Associated Press. Kika also appears to be adapting to her new digs. Alba was given a tracking bracelet, and she’ll be regularly monitored by a medical team over the next six months. Conservationists are concerned about her health, but they’re even more concerned about potential poachers; Alba, with her striking white coat and vivid blue eyes, makes for a vulnerable and attractive target. Patrols have been set up in the area by national park and conservation agency staff, but they admit resources are limited. “It’s true this is a big gamble, but we hope that with our collaboration we will win the big bet we have made today,” said BOSF chief executive Jamartin Sihite shortly after Alba was released to the wild.